For your reading pleasure, more stories in the wake of Journal Register Company’s bankruptcy announcement. By summertime, however, our source reported grumbling over what was perceived as top-heaviness at Digital First Media, with new senior executive hires during a time of layoffs at MediaNews Group papers around the country. The fear: MediaNews Group was being used as a cash cow to build up DFM. Our source also noted tension between MediaNews Group types and folks imported by Paton, many of them with Journal Register Company roots. If there is a poster child for the “digital first” newspaper movement, it is probably Journal Register Co., which manages a chain of dailies and weeklies in the eastern U.S. John Paton took the helm as CEO after it emerged from bankruptcy in 2009, and implemented a wide range of digital-first moves — and yet parent company Digital First Media just announced that Journal Register Co. is filing for bankruptcy for a second time. The not-so-hidden message in all this is that despite all the pain of the last few years, the restructuring of newspapers isn’t even close to being over: as we’ve seen with the large structural changes in the steel industry, car makers and the airline market, transforming an industry with massive legacy costs is a long and bloody process. What emerges at the end remains to be seen. The reason we don’t know more about the numbers is that JRC, as a closely held company, releases financial information only selectively—in sharp contrast to its “open journalism” philosophy. Paton, for instance, has repeatedly said digital revenues at JRC were up some large percentage since he took over. He does so again in his bankruptcy note. Yes, but from what to what? Those are big numbers all right, but 235 percent of not much is still not that much, and its worth noting that JRC’s digital revenues were far below industry average when Paton took over. It’s much easier to grow fast off a low base, and Paton has used the company’s privately held status to cherry pick positive numbers without having to paint a full picture—one that definitely didn’t include an imminent bankruptcy. From RACHEL JACKSON, former Journal Register employee: The [Journal Register] Chapter 11/sale announcement does not surprise me in the least – and the employee you quoted as calling this “horseshit” is exactly right. Lastly, in the wake of the bankruptcy announcement there has been some grumbling (perhaps it’s contagious) about the fact that Project Thunderdome is located in Manhattan rather than, say, Willoughby, Ohio, where real estate costs are presumably less. Jim Brady explains the reasoning in a piece by Adrienne LaFrance for Nieman Journalism Lab, Why does Project Thunderdome have to be in New York City? Great research. Seems like a lost art. 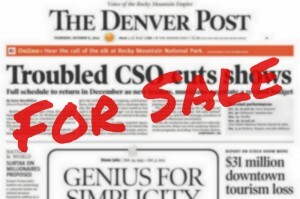 Full Disclosure- I separated from the Denver Post in early August. I found this article to be interesting about the possible true intentions of this move. Kelly – That is an interesting piece — thanks for sending it along. Paton says the process might take as little as 90 days, so we shouldn’t have to wait too long to see how things shake out.